It makes a lot more sense like this, although I was amused by the thought of them doing a Chinese fire drill type of maneuver halfway up to the front. 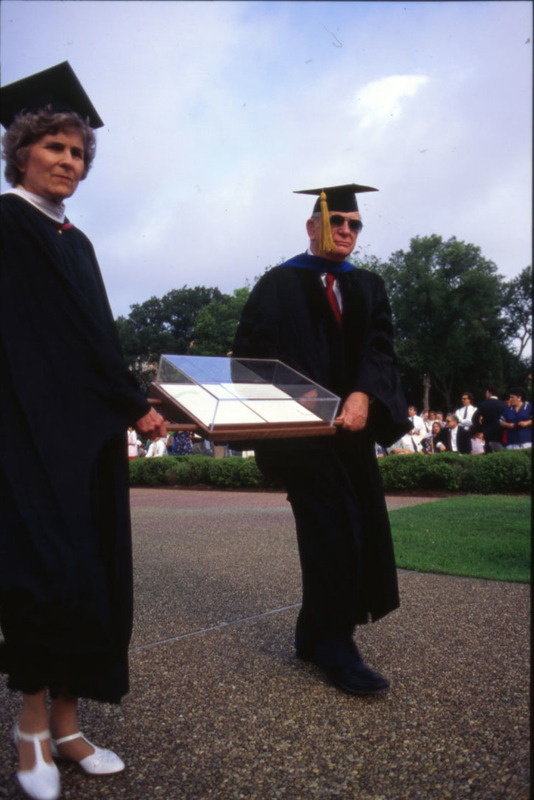 Next, many thanks to astute reader Pat Martin, who wrote in with the explanation of this event: During the 1988-89 academic year, President Rupp named Bud Rorschach to head a committee that proposed ways to celebrate the centennial of Rice’s charter in 1991. Sub-committees sought ways to involve the broader Rice community in the celebration, and I believe this was one of the results. Is the charter (or a facsimile) in that box? Surely there is a folder on that Charter Centennial–in the Rupp or Rorschach papers? Brown and Brotzen were appropriate to carry the document, of course. Bonus: Well, this is embarrassing. Honesty compels me to include the email I got yesterday morning from my colleague Lee Pecht, University Archivist and Director of Special Collections: Silly question about the box being carried in the procession. We have the box in the vault and it held a facsimile of the charter for the charter centennial. The stupid box was sitting only a few yards from where I work.